Yes, it’s another rave from the grave: a retro calculator from Julian’s past calculator history. This one is from 1976, so I bought mine after I’d finished school and before I started university. It’s the Commodore SR 4190R, made in England (take that, oriental factories! ), and a more fabulous button-oriented jabberwock of a calculator is hard to imagine. 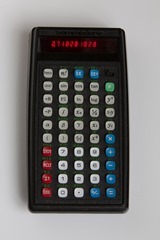 And, unlike graphics calculators of the present day with their menus and pixel displays, this is “just” a calculator. So, “SR” because it’s a “slide rule” and “R” because it contains a rechargeable NiCd battery pack, 3×AA sized. The “90” part because there is, to all intents and purposes, 90-ish functions available from the keys. There’s the usual scientific, trig, and stats functions, together with a large set of conversion functions (lb to kg, inch to cm, gallon to l, and so on). But it doesn’t stop there: there’s three probability distribution functions (binomial, Gaussian, and Poisson) for example, as well as complex number arithmetic and combinations/permutations and factorials and the Gamma function. And for good measure there’s even a couple of memories. Phew. Coupled with all those functions is a 10-digit display, although internally it uses 12 digits for calculations. And those keys are just lovely, all 49 of them, nicely color-coded. It’s hard to see from the photo, but the keys are slightly concave. Your fingers just seem to slip naturally into the key depressions as you type away at your calculations. The LEDs are bright and visible and draw power like nobody’s business; hence the rechargeable batteries. My particular calculator got lost a while back, a victim of various moves and a dead rechargeable battery pack. I’ve been looking for a long while for a good example to appear on eBay (I’d found this model’s bigger brother, the SR 9190R, a couple of years or so ago), but they are, for some reason, very rare. Finally last week I struck gold and got one whose battery didn’t hold a charge but that did work with a power supply plugged in, and it was in very good condition with a pristine label on the back (they get scuffed easily). It turns out that someone had actually removed the battery pack (thankfully: when they leak, it’s nasty), so I replaced it with a brand new one I’d bought and recharged it overnight. As you can see from the photo, the LEDs are perfect and the new battery pack is working out really well. I arrived here because my second calculator was also a Commodore SR4190R made in England. Now although my first calculator was a Triton 1200 (contender for the worst calculator ever), I did notice some further coincidences. I also worked for CAP around the same time as you, I also emigrated from UK to the US, and I also spent much of my career using Delphi. And I did do a Physics degree, so you'll be pleased to know my SR4190R was made full use of! I kept my SR4190 for quite a few years, replacing the battery pack, until finally the on/off switch broke and I threw it away. 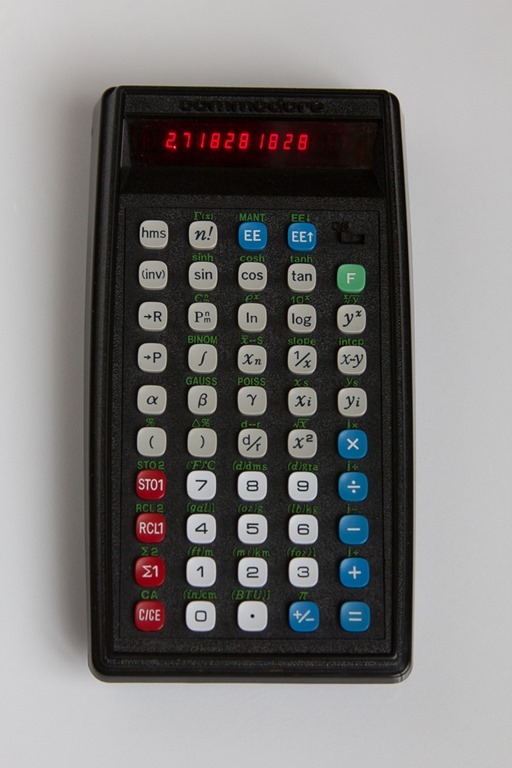 My third (and current) calculator is a Casio fx-115D which has been awesome and I don't suppose I'll ever buy another. My pride and joy is not a Volvo 1800s but a Porsche 911 Carrera S.